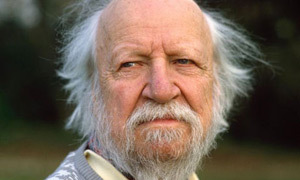 Sir William Gerald Golding was a British novelist, poet, playwright and Nobel Prize for Literature laureate, best known for his novel Lord of the Flies. He was also awarded the Booker Prize for literature in 1980 for his novel Rites of Passage, the first book of the trilogy To the Ends of the Earth. In 2008, The Times ranked Golding third on their list of "The 50 greatest British writers since 1945."